LCMS Grade TFA Amps (Ultra High Purity) Amps - CovaChem, LLC. CovaChem's LCMS Grade Trifluoroacetic acid (TFA) is well suited as a chromatography additive for difficult to separate analytes in HPLC and LCMS applications. CovaChem's LCMS TFA is an ideal additive for separations of peptides in peptide synthesis applications. Trifluoroacetic acid is widely used to separate both protected amino acid chains and deprotected peptides. Due to the amino and carboxylate groups having vastly different pka values, synthetic peptides can be particularly challenging to separate, The HPLC separation of peptides is much more easily achieved with 0.1% Trifluoroacetic acid being present in the mobile phase. Trifluoroacetic acid (TFA) is typically beneficial as a separations enhancer, and is a moderately strong ion pairing agent, which can be a very effective way of gaining good analyte separation and obtaining sharp peaks in HPLC applications. Although TFA is and excellent low pH buffer for HPLC applications, this ion pairing effect has some negative impact on ionization efficiencies (compared to other acid additives, such as Formic acid (CovaChem 11202) and Acetic acid (CovaChem 11201. CovaChem offers several remedies for the impact of 0.1% TFA on ionization, in serving highly refined products that reverse this effect. This reduction of ionization efficiency can be overcome by incorporating a post-column addition of a “TFA fix” reagent, such as CovaChem's UltraPure (2-(2-methoxyethoxy) ethanol (CovaChem 11207) or LCMS Grade Propionic acid (CovaChem 11206). These products are easy to employ, and allow LCMS to be performed on peptides and proteins without altering HPLC methods that employ 0.1% TFA. These tfa fix reagents have saved countless hours of hplc method development and validation hours. Please feel free to contact our technical support for more information on this subject. 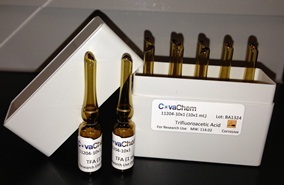 CovaChem's LCMS Grade TFA comes in two convenient package sizes (10 x 1 mL Ampules and 25 mL bottles). The 1 mL Ampules of LCMS Grade TFA are useful for quickly preparing 1 Liter bottles of 0.1% TFA solutions in either water or other organic solvents.